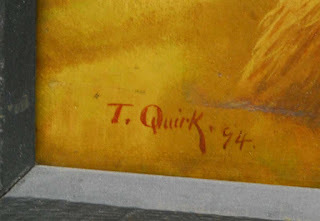 Painting signed T. Quirk '94. In the Summer of 2015, this beautiful golden landscape painting went up for sale in Vermont. We were intrigued because the painting was well executed, located in New England and had the name Quirk associated with it. We know that Francis Quirk summered in Maine and planned to spend a good deal of time there painting after retiring from teaching at Lehigh University. The Quirk name is not common, however there are a few other painters with the name in the listings. Artnet lists seven Quirks and there is a Danny Quirk who paints some interesting anatomical paintings. Circumstances did not allow us to attend the preview or the auction. But there has been that nagging feeling that perhaps this actually may have been a work by Francis. Whatever the case, digging into it has been an interesting journey. 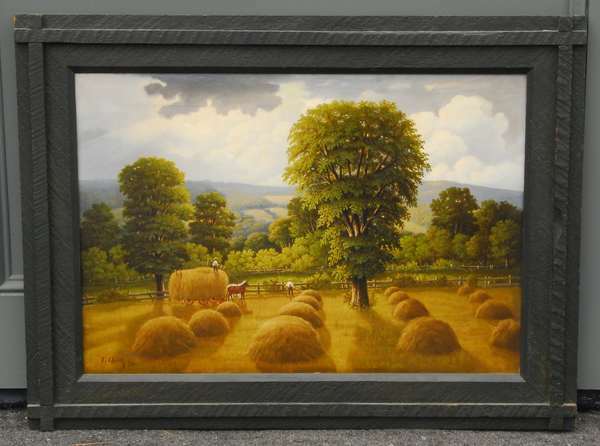 While we had never seen a pastoral landscape by Quirk, we had seen his tremendous versatility with works in oil, pastel, and watercolor. He also was not afraid to take on a variety of subjects including portraits, animals, marine paintings and even figure studies. Francis J. Quirk could paint almost anything. 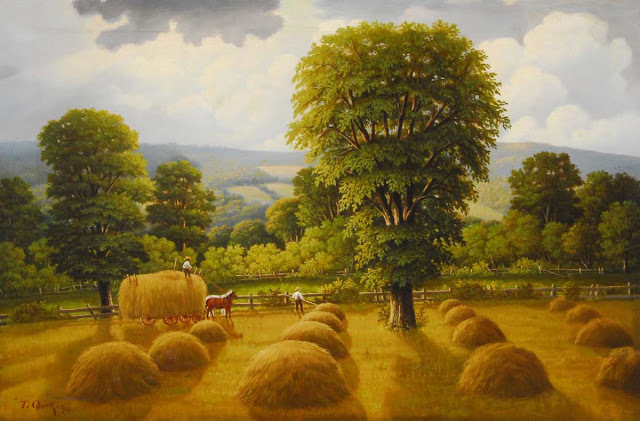 The subject matter implies that the painting is older as the farmers collecting the hay use a horse drawn wagon and stacks,not rows, of hay are drying in the golden field. According to a History of Hay Farm Equipment on the FarmCollector.com website tractors did not begin replacing horses until the 1930's. But we doubt that there were many still farming this way in the 1970's. Even in the communes of Vermont. The detail is commendable with shadows of trees and haystack highlights well executed. The background hills, fences and workmen also exhibit the skill of a talented hand. The workers move the hay manually. The Elm trees also are a sign that this painting is either drawn from imagination or comes from a period before Dutch Elm Disease wiped out the mature trees in the U.S. 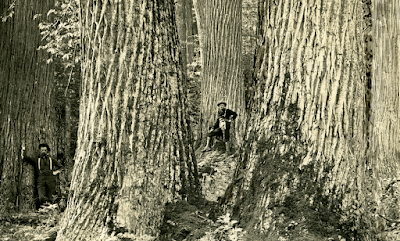 This disease came to the U.S. in 1928 through a shipment of elm wood from the Netherlands. The disease was contained fairly well,but broke out in World War II and effectively eliminated the natural cathedrals along our streets by 1989. It is possible that if a painter in 1974 could have been painting healthy Elm Trees, but not likely. The Featherduster Elm of Wolfeboro, NH died in 1986 from Dutch elm Disease. The Main Street landmark was the tallest in New England and 217 years old. 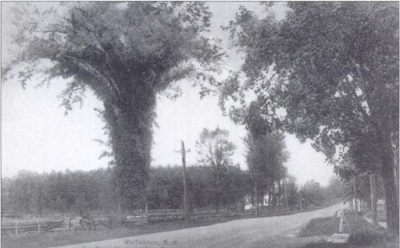 Wolfeboro, New Hampshire’s Featherduster elm tree once was a famous landmark marking the entrance to town. Note the enormous size of the elm in the painting. It is 3 feet in diameter. There may be chestnut trees in the background as well. 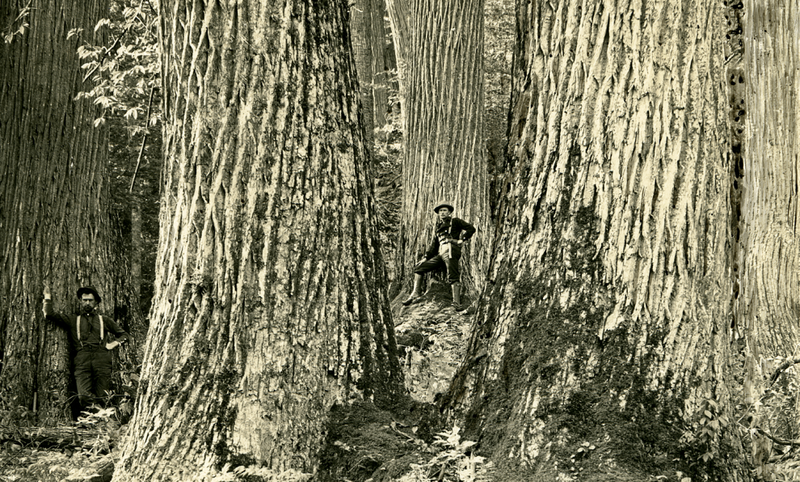 Chestnut was once the most prominent tree in the forests of the East Coast, but they were logged for construction materials and many a colonial barn timbers are made of the fire resistant wood. But the trees that the loggers did not get were finished off by a blight that came to the country in 1904 from Japan. If this was painted by Francis Quirk, then it had to be painted by imagination; perhaps as a favor for someone or an illustration. Without seeing the painting and checking the back for other clues, this brings it down to the signature. The signature clearly says “T. Quirk”. 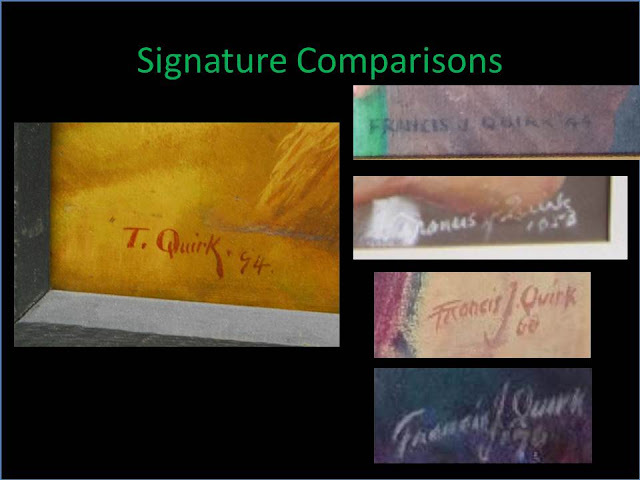 The signature is executed with some care with emphasis on the vertical lines on the Q and the lower tail of the K. But when comparing that to the signatures of the known Quirk works, we can see that there are some similarities. The first letter is canted to the right with the top cross stroke sometimes executed like a T and the lower cross stroke de-emphasized. The middle letters in Quirk are similar in execution with a tail on the u and a higher dot on the i. Finally, the finishing K is given greater emphasis. Note how the upper right portion of the letter is lengthened in both the lower right signatures. The date also adds an element of mystery. It follows the same format of all the works we have seen dated by Quirk with an apostrophe and two digits. The numeral four is formed in the same classic style as that of the top Summer Preacher painting of 1944. But the first digit remains an enigma. If it is a 9, then the painting is not by Quirk as he was born in 1907 and died in 1974. On the other hand, if it is a 7, then it could have been painted in the last year of his life. But if it was the 1874 or 1894, then Francis was not yet even born in Pawtucket, Rhode Island. The 1870’s was a time of healing after the Civil War when people were seeking a more peaceful time. 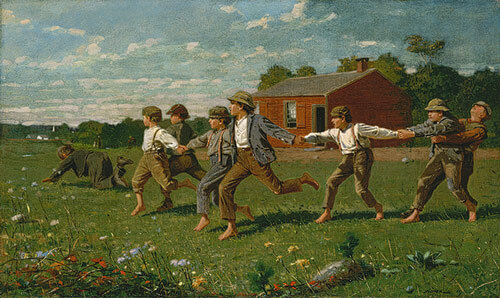 While 19th century's foremost painter Winslow Homer executed some wonderful paintings during the war such as "The Sharpshooter" His painting of innocence such as “Snap the Whip” are perhaps well remembered and a salve for a country violently ripped apart. At this time the country was industrializing and the little red school houses were becoming a thing of the past. The exuberant boys have the bare feet of youth and the suspenders of mature men at labor. Like the nation, they are struggling to stay united. After seeing many of Quirk's paintings in the Maine estate sale, we have come to the conclusion that this painting is not by Francis Quirk. We come to this conclusion based on three reasons. 1. The signature is not typical. We have never seen him sign his work with an initial and the last name. Every other signature spells out his full first name and frequently includes his middle initial. 2. 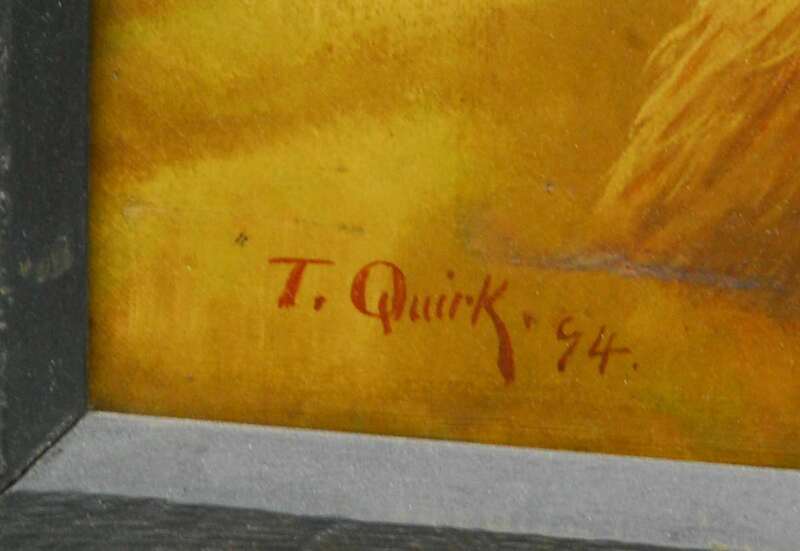 The signature is T. Quirk. It is unlike Francis to make such a sloppy error of leaving off the middle cross mark of an 'F' particularly in such a carefully executed signature. 3.The painting style is not in keeping with his oeuvre. It is a nice painting, but not by Francis Quirk.